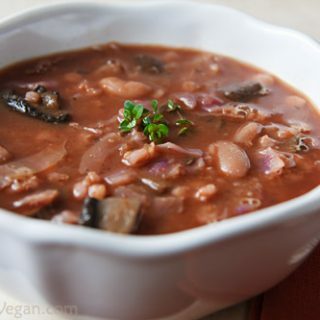 A smoky, rich broth makes this Mushroom Barley Soup delicious, and barley and beans make it hearty, and satisfying. When my friend and frequent blog commenter moonwatcher recommended Anna Thomas’ new book Love Soup, I knew I had to have it. The recipes sounded so unusual and the seasonings so much to my taste (ancho chilies, smoked paprika, toasted cumin) that I was sure it would appeal to me. Unfortunately, I often have more ambition than time when it comes to reading new books, so I haven’t fully explored Love Soup yet. Instead, I opened the book to the first recipe for which I had most of the ingredients and decided to make an adaptation of it right then and there. 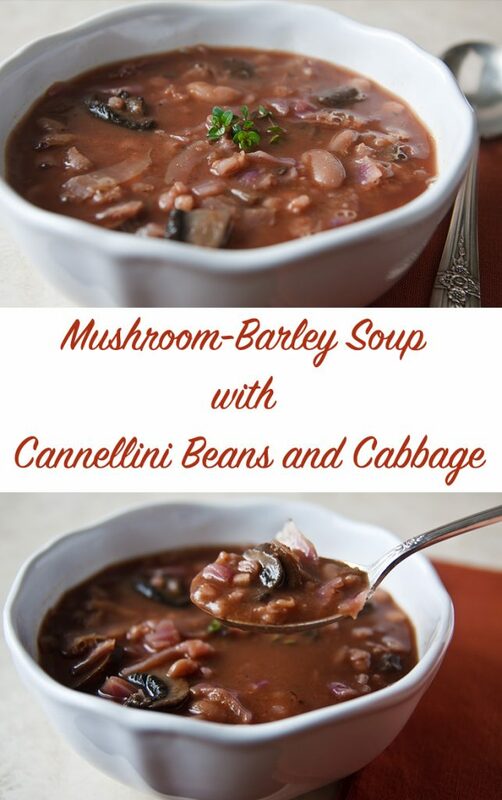 This recipe was originally Mushroom-Barley Soup with Cabbage, but being the kind of cook who wants to get everything–starch, vegetable, and protein–in one pot, I added cannellini beans, making it less brothy and more of a main dish. And true to my procrastinate-then-rush style of cooking, I sped up what was meant to be a slow-cooked soup by using a pinch of baking soda to brown the onions quickly and the pressure cooker to speed-cook the barley. I also changed the proportions of some of the ingredients and totally left out two, green onions and fresh parsley, that I didn’t have and which might make this soup even more delicious, but I don’t see how. In short, I loved it. The broth was rich and flavorful with just a bare hint of spice and the mushrooms and barley lent a heartiness, something to chew on. If the rest of the recipes are as delicious, this book was a great investment. Thanks for the recommendation, moonwatcher! I used the Instant Pot pressure setting to speed up the cooking of the barley, but I opted to cook the rest of the soup on sauté. I like the flavor that slow simmering gives it, but if you are in a big hurry, you could try returning the pot to pressure and cooking under pressure for 4 minutes before allowing a natural release for 15 minutes. But with the time it takes to get to pressure, this isn’t a huge time saver. I used red cabbage, which gave this soup a wonderful, rich color, but I think any type of cabbage will do. If you don’t have hot smoked paprika, use mild and add a pinch of chipotle or cayenne to give the soup a slight kick. 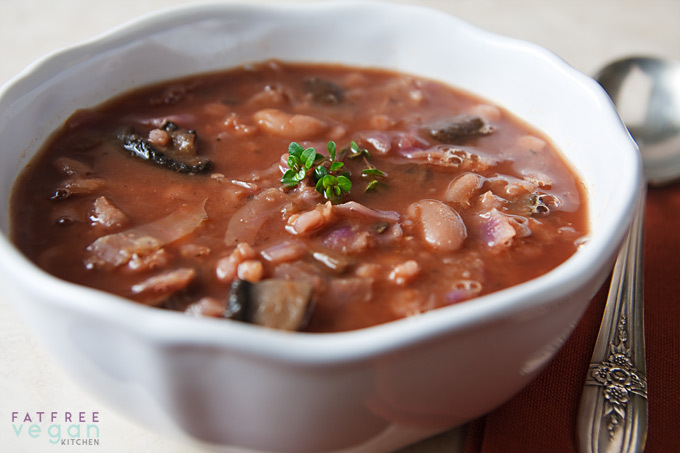 Place the barley in a pressure cooker or large soup pot, add the vegetable broth, and bring to a boil. If pressure cooking, lock the lid in place and bring to high pressure; cook under pressure for 18 minutes. (In an Instant Pot, just set the pressure to high and set the timer for 18 minutes.) Bring pressure down with a quick release method. 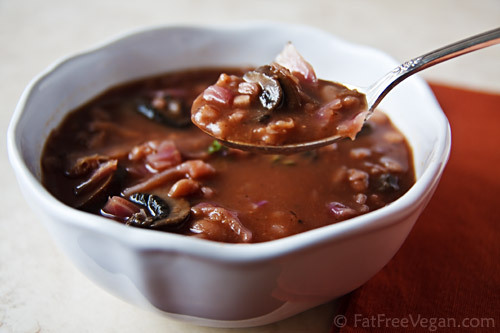 If cooking in a regular soup pot, lower the heat and simmer, covered, for 30 to 40 minutes. While the barley is cooking, cook the onion in a non-stick skillet over medium-high heat until it softens and begins to brown; adding a pinch of baking soda will speed up the browning. Once it’s beginning to brown, add the garlic and mushrooms and a little salt and pepper, reduce the heat, cover, and cook, stirring regularly, until mushrooms soften, about 3 to 4 minutes. Add the thyme and sherry and cook until the alcohol cooks off. Once the barley is cooked, add the mushrooms to the barley along with the sliced cabbage and paprika. If there are dried bits in the skillet, use a little of the water to deglaze it, and add that and the remainder of the 4 cups of water to the pot too. Add the cannellini beans and simmer, covered, for about 30 minutes, until the cabbage is tender, adding extra water if it gets too thick. Stir in the lemon juice just before serving and add more salt and pepper to taste. Just made this for the first time and just had to share with everyone. We added a splash of white vinegar and some more freshly ground black pepper to our bowls and we felt like we were eating Chinese Hot & Sour Soup! It was delicious! I followed the recipe without any other changes. I’m going to make this with Job’s Tears, which is a great GF substitute for barley! Giving it 5 stars cuz I know it’s gonna turn out amazing.